Cold Dude Computers: Prehistoric Party Sneak Peek! WARNING! THIS POST CONTAINS SPOILERS! 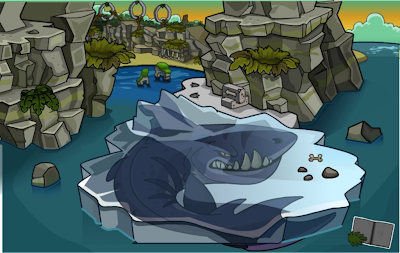 Recently Club Penguin's new CEO, Spike Hike released a Sneak Peek of the Prehistoric Party on his Twitter, the picture he gives reveals the truth about the Iceberg! So the Iceberg is really a REALLY big shark that has frozen! Maybe it died or something? But from this picture we can see that there will be a catalogue at the Iceberg and there will be an island right next to it. What do you think the story behind the shark will be? Leave a comment and let me know!